Who was Saint John Fisher, the patron of our parish? John Fisher was born in Yorkshire, England in 1469, the son of a cloth dealer. He was educated at Cambridge University beginning at age 14, and became a distinguished scholar. He was ordained a priest in 1491 at age 22, and became vice-chancellor of the university ten years later. John Fisher did much to improve the university, and in 1504 became its chancellor. He was appointed Bishop of Rochester the same year. He was noted for his educational reforms, his preaching, and was said to have one of the finest libraries in Europe. Bishop Fisher was chaplain and confessor to Lady Margaret Beaufort, mother of King Henry VII. It is believed that he was a tutor of Prince Henry, who would become King Henry VIII upon his father's death. It wasn't long after Henry VIII ascended to the throne that conflict arose between the two men. As Bishop, John Fisher defended the traditional Catholic doctrine against Protestant reformers in other English universities. King Henry VIII had once been a sincere Catholic and had authored a book strongly criticizing Martin Luther and the Reformation movement in Europe. His wife, Catherine of Aragon, had only a single daughter, Mary, who survived infancy. Henry wanted a male heir and was determined to divorce his wife and marry Anne Boleyn. Bishop Fisher led the ecclesiastical opposition to the King's effort to divorce Catherine of Aragon, becoming the Queen's chief supporter and most trusted counsellor. He appeared on the Queen's behalf in court, where he declared that, like St. John the Baptist, he was ready to die on behalf of the indissolubility of marriage. His statement enraged the King, and he never forgave John Fisher. In November 1529, the "Long Parliament" of Henry VIII's reign began a series of encroachments on the Catholic Church. As member of the House of Lords, John Fisher warned Parliament that such acts could only end in the utter destruction of the Catholic Church in England. When Pope Clement VII refused to annul his marriage, King Henry decided to remove the Church of England from the authority of Rome. In 1534, the Act of Supremacy recognized Henry as "the only Supreme Head on earth of the Church of England". Henry declared his marriage to Catherine null and void. Parliament passed the Succession Act, declaring that Henry and his new wife, Anne Boleyn, were the legitimate heirs to the throne. Bishop Fisher refused to acknowledge the Succession Act or take the oath that the King was supreme head of the Church. He was arrested and sent to the Tower of London on April 26, 1534, where he remained for more than a year under severe conditions. In May 1535, newly elected Pope Paul III elevated John Fisher to Cardinal, hoping to induce Henry to ease the mistreatment of the priest. The act had just the opposite effect: Henry refused to allow the Cardinal's hat to be brought to England, declaring he would send John Fisher's head to Rome instead. Cardinal Fisher was tried as a commoner for treason because of his refusal to acknowledge that the king was the supreme head of the Church of England. He was found guilty and condemned to death. He was beheaded on June 22, 1535. Cardinal Fisher met death with a calm dignified courage which profoundly impressed all present. After beheading, his body was stripped and left on the scaffold until evening, when it was thrown naked into a grave in a local churchyard. John Fisher’s head was stuck upon a pole on London Bridge, but its lifelike appearance drew so much attention that it was thrown into the Thames River. Sir Thomas More was beheaded on July 6, just 14 days after John Fisher. John Fisher’s body was moved and laid beside that of Sir Thomas More in the church of St. Peter ad Vincula by the Tower of London. 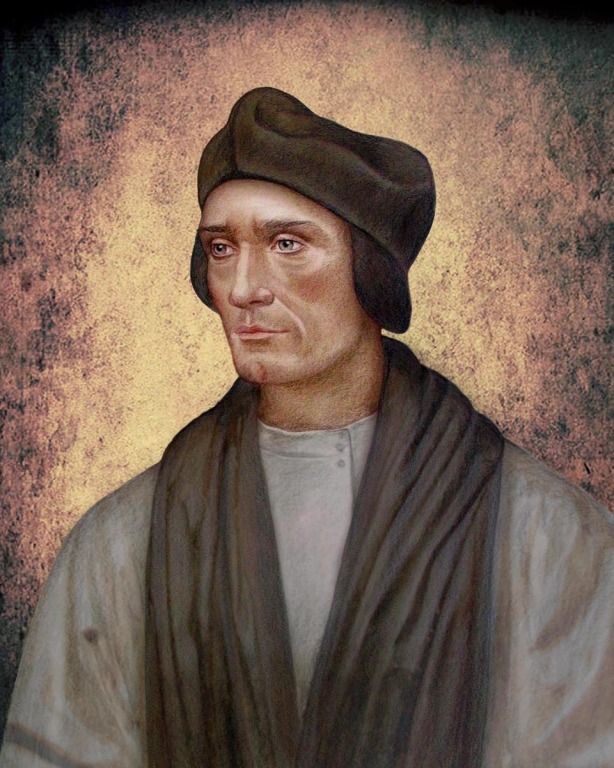 St. John Fisher and Sir Thomas More share a feast day on June 22. Compiled from The Everything Saints Book, Praying with the Saints and The Catholic Encyclopedia.